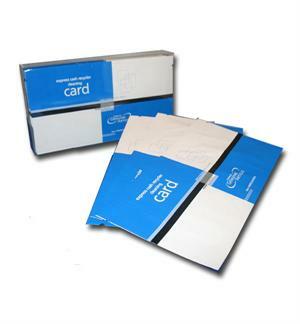 Express Cash Recycler/Currency Counter Cleaning Card Pack features a double-sided diamond flocking, moistened with correct dosage of high quality electronics-compatible cleaning solvent, in practical, convenient tear-open pouch (Sachet). Area of application cash recycling machines, including single bank note and high speed bundle bank note acceptors. This cleaning card fully features the high speed treatments of Express Cash Recyclers and currency counters. It grants a great and effective cleaning result, even in high speed mode. Specials ECS’ philosophy for high tech product care and cleaning is based on FLOCKTECHNOLOGY®. Cleaning cards, moistened and portioned with non-corroding premium cleaning solvent and stored in practical, easy to use tear-open pouch (Sachet). Reduced machine failures of high speed cash recycling systems. Excellent cleaning results, thanks to FLOCKTECHNOLOGY® and mild, non-corroding premium cleaning solvent. Simple and easy handling, thanks to practical tear-open pouch (Sachet). Simultaneous cleaning of SCANNERS, drive rollers, driving belts and mechanics. Base material: PVC, FLOCKTECHNOLOGY® on either side, moistened with right portion of non-corroding premium solvent, stored in a practical tear-open pouch.